Your main mission in life is to vandalise a school for some reason. Only problem is... you'll have to play to find out! It's a shame that the school janitor doesn't react when you throw a brick in the window. A little credibility wouldn't hurt and it could have been fun. 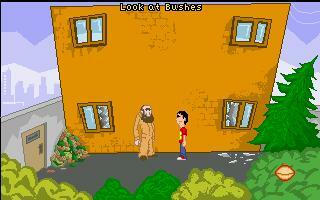 A more visual friendly version of Bob Goes Home, a game filled with mysterious keys. Although didn't seem to need all the keys to finish the game in this version. Fun little game... deserves better than what it is rated.